Malonate utilization, an important differential trait, well recognized as being possessed by six of the seven Cronobacter species is thought to be largely absent in Cronobacter sakazakii (Csak). The current study provides experimental evidence that confirms the presence of a malonate utilization operon in 24 strains of sequence type (ST) 64, obtained from Europe, Middle East, China, and USA; it offers explanations regarding the genomic diversity and phylogenetic relatedness among these strains, and that of other C. sakazakii strains. In this study, the presence of a malonate utilization operon in these strains was initially identified by DNA microarray analysis (MA) out of a pool of 347 strains obtained from various surveillance studies involving clinical, spices, milk powder sources and powdered infant formula production facilities in Ireland and Germany, and dried dairy powder manufacturing facilities in the USA. All ST64 C. sakazakii strains tested could utilize malonate. Zebrafish embryo infection studies showed that C. sakazakii ST64 strains are as virulent as other Cronobacter species. Parallel whole genome sequencing (WGS) and MA showed that the strains phylogenetically grouped as a separate clade among the Csak species cluster. Additionally, these strains possessed the Csak O:2 serotype. The nine-gene, ~ 7.7 kbp malonate utilization operon was located in these strains between two conserved flanking genes, gyrB and katG. Plasmidotyping results showed that these strains possessed the virulence plasmid pESA3, but in contrast to the USA ST64 Csak strains, ST64 Csak strains isolated from sources in Europe and the Middle East, did not possess the type six secretion system effector vgrG gene. Until this investigation, the presence of malonate-positive Csak strains, which are associated with foods and clinical cases, was under appreciated. If this trait was used solely to identify Cronobacter strains, many strains would likely be misidentified. Parallel WGS and MA were useful in characterizing the total genome content of these Csak O:2, ST64, malonate-positive strains and further provides an understanding of their phylogenetic relatedness among other virulent C. sakazakii strains. Cronobacter species are Gram-negative bacteria which can cause severe infantile septicemia, meningitis, and necrotizing enterocolitis and pose a serious threat to neonates and underweight infants [1, 2]. Cronobacter species can also cause infections in adults with a high percentage of infections presenting as septicemia, pneumonia, wound, and urinary tract infections [3–5]. The genus Cronobacter has seven species: Cronobacter sakazakii, Cronobacter malonaticus, Cronobacter turicensis, Cronobacter universalis, Cronobacter dublinensis, Cronobacter muytjensii, and Cronobacter condimenti [6, 7]. Since the discovery of C. condimenti in 2012, there has been no epidemiological evidence associating this species with human infections and thus was considered to be avirulent. Recently Eshwar et al. performed infection studies where zebrafish embryos were exposed to C. condimenti and found that C. condimenti strain LMG 26250T caused an 80% mortality rate within 4 days post infection suggesting that it is as virulent as other Cronobacter species. However, C. sakazakii, C. malonaticus, and C. turicensis are currently considered to be the primary pathogenic species found to cause the majority of illnesses . Infantile Cronobacter infections have often been linked to the consumption of reconstituted, temperature-abused, intrinsically or extrinsically contaminated powdered infant formulas (PIF). Because PIF is not manufactured as a sterile product, it poses a significant consumer risk should contaminated lots be prepared and handled inappropriately. Subsequently this led to the publishing of guidelines for proper PIF preparation (http://www.who.int/foodsafety/publications/micro/PIF_Bottle_en.pdf) by the World Health Organization. Notably, Jason  reported that 8% (7/82) of infected infants studied during 2004–2010 presented with invasive disease (defined as a culture-positive, confirmed case of septicemia or meningitis) and consumed breast milk without any PIF or human milk fortifier supplementation prior to onset of illness. Freidemann and Bowen have reported similar findings [11, 12]. Aside from contaminated PIF, sources of these infections in both infants and adults have been elusive. Additionally, Cronobacter species can be detected within other dried foods, ready to eat foods, and food production environments, such as in dried food manufacturing facilities, posing a risk to susceptible consumers [11, 13]. Thus, it is important that the food manufacturing and public health communities continue surveillance efforts to find the presence of these organisms in food products and within food processing environments. Malonate is thought to be produced both in root tissues and leaves of plants . Malonate utilization has been a trait well recognized as being possessed by six of the seven Cronobacter species, excluding C. sakazakii. However, Iversen et al. reported that a small number (< 5%) of C. sakazakii strains can also utilize malonate. Until the present investigation, this finding was largely overlooked and under-appreciated. Representative malonate utilization operon alleles were first observed in a group of C. sakazakii strains obtained from a surveillance assignment of USA dairy powder manufacturers in 2014 using a previously described custom-designed, novel pan genomic DNA microarray . The microarray contains 50 pan-genomically conserved malonate operon alleles which are represented on the array and primarily come from the genomes of C. turicensis and C. malonaticus. These genes are located in Genome Region (GR) GR34 of C. malonaticus type strain LMG23826T, as described by Grim et al. . GR34 encodes for the components of enzymes and proteins involved in the decarboxylation of malonate, and include a malonate utilization transcriptional regulator mdcR, a malonate transporter gene, mdcF, and the gene mdcE, which encodes for a stabilization protein. MdcE is thought to stabilize MdcF with the beta chain of the acetyl-coenzyme-A carboxyl transferase. Malonate decarboxylase in C. malonaticus comprises the oligomerization of alpha, delta, beta, and gamma protein subunits and is encoded by four genes, mdcADBC. Finally, this gene cluster also contains genes encoding for a 2-(5′-triphosphoribosyl)-3′-dephosphocoenzyme-A synthase (ybdT), malonyl CoA acyl carrier protein transacylase (fabD) and a phosphoribosyl-dephospho-CoA transferase (mdcG), which are thought to stabilize the coenzyme-A complex [15, 16]. The under appreciation of malonate-positive C. sakazakii strains that are associated with foods suggests that possible misidentification when relying on phenotypic identification schemes alone may occur, hampering correct species identification for epidemiological purposes. Proper species identification of Cronobacter is imperative given the recent proposals by Jason , Friedemann , and Farmer  to include this organism as a member of the Centers for Disease Control and Prevention’s and the Council of State and Territorial Epidemiologists’ notifiable disease list. Microarray analysis (MA) and subsequent whole genome sequencing (WGS) analysis of C. sakazakii strain CDC 1121–73, a serotype Csak O:2, sequence type (ST) 64 clinical strain obtained in 1973, showed that this strain possessed the alleles of an entire malonate utilization operon . With this uncharacteristic finding, further microarray interrogation of other C. sakazakii strains revealed that 22 additional C. sakazakii strains from spice, milk powder, dairy powder and PIF manufacturing facilities in the USA, Middle East, and Europe possessed the entire operon as well. The Food and Drug Administration’s (FDA) and its global food safety partners’ capacity to protect the public rests on the ability to identify and characterize foodborne pathogens quickly and accurately so that circulating contaminated foods can be rapidly removed from commerce. In addition to gaining an understanding of the pathogenicity of the species, this study also assessed WGS as a method for characterization of Cronobacter strains, a method which is hoped to one day be adapted clinically for detection and treatment purposes. The main purpose of this study was to analyze the genomic content of these recently recognized malonate-positive C. sakazakii strains that originated from clinical, milk powder, spice, and powdered infant formula and dairy powder manufacturing environments using next generation sequence tools such as DNA microarray and WGS. We hope that the knowledge reported here regarding these organisms will add to the surmounting body of genomic information about this life-threatening foodborne and noted public health pathogen so that relevant molecular clinical and food diagnostic assays may be further developed. The Cronobacter strains analyzed in this study, with corresponding metadata, are listed in Table 1. These strains represent isolates acquired from foods, environmental and clinical sources and were obtained from multiple and diverse geographical areas and were selected out of a pool of 347 strains obtained from various surveillance studies [19–22]. Identity of Cronobacter species was based on the Cronobacter classification scheme as proposed by Iverson et al. and Joseph et al. . Additionally, all strains tested positive for the 350 bp zinc metalloprotease (zpx) genus-level gene . Species identity was also established using the species-specific rpoβ PCR assay as noted by Stoop et al. and Lehner et al. , and the cgcA species-specific PCR assay as described by Carter et al. . These strains were serotyped according to the typing scheme proposed by Yan et al. . The isolates were also subjected to RepF1B plasmidotyping as described by Franco et al. . Multiple locus sequence typing (MLST, ST) of the strains was performed either by uploading genome FASTA sequences to the Cronobacter MLST website (http://pubmlst.org/cronobacter/) or by performing the PCR reactions according to the procedure described by Baldwin et al. and Jolley and Maiden . Prior to submission to the Cronobacter MLST website, PCR amplicons were first purified using the Qiagen PCR purification kit (Qiagen, Inc. Germantown, MD), and submitted to Macrogen, Inc. (Rockville, MD) for sequencing. Where noted, we have confirmed the STs of the strains reported in Table 1 through using their WGS assemblies and the MLST website listed above. The genome sequence for C. sakazakii strain Cro2819A3 as reported by Zheng et al. was obtained from the National Center for Biotechnology Information (NCBI) under accession #: NZ_MBSC00000000. Malonate utilization was assessed for all strains (except for C. sakazakii strain Cro2819A3) and controls using Malonate broth (Ewing’s Modification, Thermo Fisher, Inc. Grand Island, NY). These organisms could utilize sodium malonate as a carbon source and ammonium sulfate as a nitrogen source which produced an alkaline reaction (> pH 7.4) leading to a color change of the bromothymol blue (bromothymol sulfone phthalein) indicator dye from green to blue as described by Leifson  and Ewing et al. . Frozen bacterial cultures were stored at − 80 °C in Trypticase soy broth (BBL, Cockeysville, MD) supplemented with 1% NaCl (TSBS) and 50% glycerol and were streaked onto plates containing Enterobacter sakazakii Chromogenic Plating Medium (R&F Products; Downers Grove, IL) and incubated overnight at 37 °C. Typical Cronobacter-like colonies were chosen to inoculate duplicate TSBS broth cultures (5 ml) which were incubated at 37 °C, shaking at 150 rpm for 18 h. Bacterial DNA was extracted and purified using Qiagen’s Qiacube technology (QIAGEN Sciences; Germantown, MD) according to the manufacturer’s instructions. The concentrations of the DNA samples were determined using a NanoDrop spectrophotomer (Thermo Fisher Scientific; Wilmington, DE). Typically, the DNA samples possessed a DNA concentration of between 10 and 60 ng/μl. For WGS analysis of the strains, a more precise measurement of the concentration of these DNAs was then determined using a Qubit Fluorometric spectrophotometer (Life Technologies, Thermo Fisher Scientific; Wilmington, DE) for quantitation, using one of the DNA sample replicates. DNA samples were diluted with deionized water to a final concentration of 0.2 ng/μ1. Whole-genome sequencing was performed using a MiSeq benchtop sequencer (Illumina, San Diego, CA, USA), utilizing either 500 or 600 cycles of paired-end reads (Illumina). FASTQ datasets were de novo assembled with CLC Genomics Workbench version 7.0 (CLC bio, Aarhus, Denmark). The paired end libraries were generated and sequenced in conjunction with the Nextera XT DNA Sample Preparation Guide on the Illumina Miseq instrument (Illumina; San Diego, CA). Sequence data for each strain was uploaded onto the Rapid Annotation Subsystems Technology (RAST) server for annotation . For microarray analysis, the duplicated purified DNA samples were further concentrated using an Amicon Ultracel-30 membrane filter (30,000 molecular weight cutoff, 0.5 ml, Millipore Corp. Billerica, MA) to a final volume of approximately 10–25 µl. Comparative genomics and phylogenetic analysis were carried out using Geneious (http://www.geneious.com), LASTZ  implementation on Geneious, and MEGA 7 suite . Local BLAST+ analysis was carried out wherever necessary. Whole genome SNP analysis was carried out using kSNP3 software . The DNA microarray used in this study was an Affymetrix custom array (Affymetrix design number: FDACRONOa520845F) which utilizes the whole genome sequences of 15 Cronobacter strains, as well as 18 plasmids. These 15 strains encompassed all proposed species of Cronobacter. This was the same microarray described previously by Tall et al. . Genomic DNA was hybridized, washed in the Affymetrix FS-450 fluidics station, and scanned on the Affymetrix GeneChip® Scanner 3000 (AGCC software) as described by Tall et al. [15, 34], Yan et al. , Chase et al. , and Kothary et al. . All reagents for hybridizing, staining and washing were made in conjunction with the Affymetrix GeneChip® Expression Analysis Technical Manual . For each gene represented on the microarray, associated probe set intensities were summarized using the Robust MultiArray Averaging (RMA) function in the Affymetrix package of R-Bioconductor as described by Bolstad et al. . RMA summarization, normalization, and polishing was done on the data received and final probe set values were determined as described by Tall et al. . Gene differences were determined and phylogenetic trees were created using the SplitsTree 4 neighbor net joining method. Husbandry, breeding and microinjection of approx. 50 CFU of bacteria into the yolk sac of 2-day post fertilization albino Zebrafish (Danio rerio) was maintained following the original procedure described in the study by Fehr et al. and later by Eshwar et al. . A total of thirty embryos (10 × 3) were injected per individual experiment (i.e. per strain). This research was conducted with approval (NO 216/2012) from the Veterinary Office, Public Health Department, Canton of Zurich (Switzerland) allowing experiments with embryos and larvae older than 120 dpf. Nucleotide sequences from this study were deposited into GenBank under accession numbers identified in Table 1. The sequences of the strains were also released to the public by submission to the NCBI under the Cronobacter GenomeTrakr Project: FDA-CFSAN bioproject: PRJNA258403 as part of the FDA’s Center for Food Safety and Applied Nutrition (CFSAN) surveillance project for rapid detection of foodborne pathogens causing illnesses or outbreaks. Twenty-three C. sakazakii strains were obtained from surveillance studies of dried milk powder, clinical, spice, and environmental samples taken from retail facilities, cheese and milk protein and powdered infant formula manufacturing facilities located in the USA, Middle East, and Europe by various investigators [13, 15, 19–22, 35]. General features of these strains, sources, malonate utilization, and genomic information of the strains are shown in Table 1. All strains were identified as C. sakazakii using the species-specific rpoβ PCR assays as described by Stoop et al. and Lehner et al. , and the cgcA species-specific PCR assay as described by Carter et al. . Moreover, all strains possessed the Csak O:2 serotype as defined by the protocol described by Yan et al. , confirming the rpoβ- and cgcA-based PCR species identity for each strain. The serotype and malonate utilization of C. sakazakii strain Cro2819A3 could not be assessed. Additionally, all strains were PCR-positive for zpx, a genus-specific target encoding for a zinc-containing metalloprotease gene . All strains were identified as C. sakazakii ST64 using the Cronobacter MLST database (http://pubmlst.org/cronobacter/) [25, 26]. We had recently described the genomes of two ST64 strains CDC 1121–3 and GK1025 from our collection, which were used as the quintessential strains in this study . The remaining 21 strains were sequenced and annotated as described earlier. As mentioned earlier, the genome of C. sakazakii strain Cro2819A3 was obtained from NCBI. The draft genomes sizes (Table 1), ranged from 4.3 to 4.7 MB, and the G+C% content ranged from 54.9 to 57.7. Around 4000–4407 DNA coding sequences were identified among the strains, sharing similar genomic features to the two earlier clinical and PIF production plant strains  and other genomes described for C. sakazakii [22, 40–42]. Phenotypically, all tested ST64 C. sakazakii strains utilized malonate (shown in Table 1). Control strains included to demonstrate malonate utilization were: C. universalis, NCTC 9529T, C. condimenti LMG23826T, C. malonaticus LMG23826T, C. turicensis LMG23827T, C. muytjensii 51329T, and C. dublinensis subspp. dublinensis LMG23823T. C. sakazakii strain BAA-894 was used as a negative control and as expected, was found to be malonate negative. Characterization of the strains for the presence of the common virulence plasmids, pESA3- and pSP291-1-like plasmids was performed. These plasmids share a high degree of sequence homology [22, 40, 41, 43], and they harbor a common incompatibility class IncF1B replicon-repA and two iron (III) acquisition systems-eitCBAD (ABC heme transporter) and iucABCD/iutA (Cronobactin, a hydroxamate-type, aerobactin-like siderophore). Targeting the homologous repA gene and the two iron acquisition system gene clusters (eitA, and iucC genes representing each gene cluster), PCR analysis showed that all strains possessed repA, eitA, and iucC genes, suggesting that the common virulence plasmids (pESA3, pSP291-1) were harbored by these strains (Table 2). Further PCR analysis of the strains showed that they all possessed the Cronobacter plasminogen activator gene, cpa. Interestingly, only the USA dairy environmental strains possess most of the type six secretion system gene cluster (T6SS) genes, e.g., T6SSIntL, vgrG, and T6SSRend targets: the strains which were isolated from the German and Swiss PIF manufacturing facilities, the milk powder sample from France and the spice strain from Jordan lacked vgrG. All strains lacked both the T6SS IntR and filamentous hemagglutinin (FHA) fhaB targets, but possessed the conserved flanking regions of FHA. These results suggest that the genomic region encompassing the T6SS may be undergoing microevolution similar to what Riccobono et al. has described for enteropathogenic E. coli  and what Franco et al. and Yan et al. had previously reported. Interestingly, only C. sakazakii strains GK1025 and Comp59 possessed both the pESA2- and pCTU3-like plasmids; all other strains were PCR-negative for the replicon targets for these two plasmids. It is thought that microbes engage in complex communication feedback systems with their hosts and environments, although many of the specific mechanisms that link these associations remain unresolved . For example, malonate is a compound particularly abundant in plants such as soybean, and malonate utilization is strongly inducible in plant and bacterial pathogens such as Xanthomonas axonopodis pv. glycines, the pathogen responsible for bacterial pustule disease . The prevailing hypothesis proposed by Schmid et al. and Joseph et al. is that Cronobacter arose during the Paleogene geologic period (between 65 and 23 million years ago, mya) of the Cenozoic era when early modern plants appeared (Paleocene epoch, ~ 65 mya) and the grassland plants (Eocene epoch, ~ 56 mya) continued to evolve. Results from microarray analysis, shown in Fig. 1 and Additional file 1: Table S1 and Additional file 2: Table S2, (Pearson’s coefficient, gene differences), and Table 3 (list of strains used for MA), revealed that the C. sakazakii ST64 strains grouped together within the C. sakazakii species cluster and these results support previous microarray findings reported by Tall et al. [15, 41], Yan et al. . and Chase et al. and those findings reported here for the rpoβ and cgcA-species specific and plasmidotyping PCR and MLST results mentioned earlier. 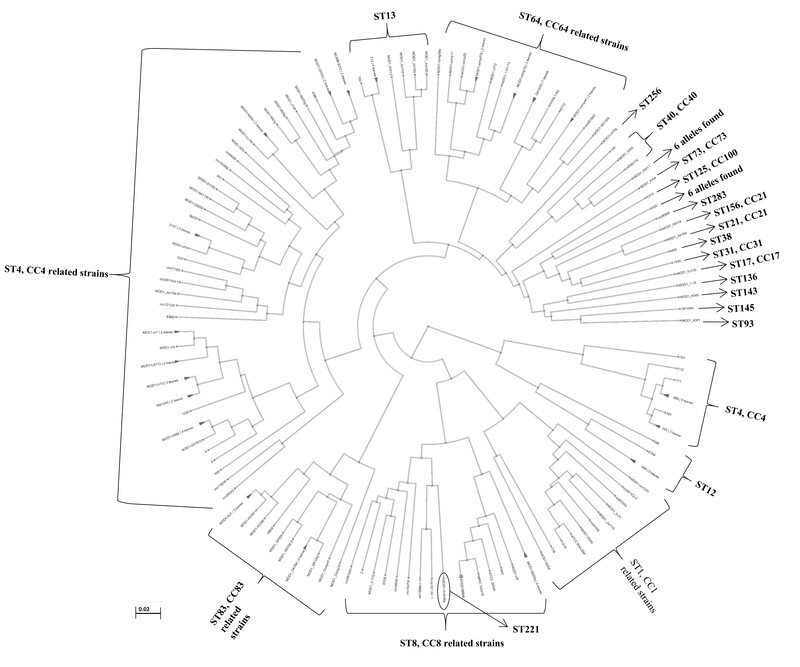 Combinatorial microarray and MLST analyses of the C. sakazakii ST64 strains showed that these strains uniquely clustered together (Fig. 1). These results also corroborate a whole genome SNP based tree which was auto generated at the NCBI C. sakazakii Genome page and reproduced in Additional file 3: Figure S1 (https://www.ncbi.nlm.nih.gov/genome/tree/1170). Phylogenetic analyses using the whole genome SNP-based tree (Additional file 3: Figure S1) and the pan-genome microarray (Figs. 1, 2) point to at least three major genomic backbone groups of C. sakazakii in which sequence types containing clinical strains separated into 2–4 clusters (e.g., ST1, ST4, ST8, and ST83 for example). Malonate positive ST64 C. sakazakii strains from this study appear in these trees as a distinct cluster. In addition, the C. sakazakii strain Cro2819A (NCBI accession#: NZMBSC00000000  and Table 1) also clustered with the other ST64 C. sakazakii strains as developed by the NCBI C. sakazakii genome tree. LMG 23733, fruit punch powder, Switz. LMG 23732T, fruit punch powder, Switz. LMG 24058, fruit punch powder, Switz. LMG 24057T, fruit punch powder, Switz. LMG 23730T, fruit punch powder, Switz. We characterized these genomes further by datamining microarray datasets and by whole genome SNP detection approaches. Total gene differences observed among the USA ST64 strains included between 0 and 216 genes (Additional file 1: Table S1, Additional file 2: Table S2). There were no differences in total genes among the German PIF manufacturing facility strains and only 45–125 genes between the German strains and the French milk powder and Jordan spice strains. This suggests that the strains obtained during the German PIF manufacturing facility surveillance study were phylogenetically-related to one another. To understand the strain-level genomic variations among the strains of ST64 group from this study, we carried out whole genome SNP analysis using our de novo assemblies reported in this study, and those reported earlier by Chase et al. and the genome of C. sakazakii strain Cro2819A3 (Table 1). As indicated in Fig. 3, the whole genome analysis using the kSNP3 algorithm showed a similar pattern of phylogenetic relatedness among the strains where the German PIF strains (Csak GK-series) clustered together (some indistinguishable among them) with the other European and Jordanian strains along with the Chinese ST64 C. sakazakii strain Cro2819A3. Although these strains were more phylogenetically diverse among themselves; they were distinct from the USA dairy powder and clinical strains. This pattern of clustering based on varying degrees of phylogenetic relatedness was supported by the pan-genomic microarray analysis (Fig. 2). The low degree of genomic diversity among ST64 strains observed in Fig. 2 can be explained as an inherent feature resulting from random acquisition of “mobilome” genes representative of the dispensable genome such as plasmids and phage sequences as proposed by Joseph et al. and Zheng et al. . The pan-genomic microarray  contains probeset sequences that cover both chromosomal and mobilome genomes, representative of Cronobacter genus. In contrast, analysis of whole genome SNPs, based on genome assemblies, is driven almost entirely by chromosomal sequences. A similar genus-wide comparison using 2500+ chromosomal core genes clustered the ST64 strains into a single group (data not shown) as predicted and indicated a generally conserved backbone of these strains with minimal differences when compared to other C. sakazakii strains, and that the mobilome of this diverse group contributes to the observed differences. It should also be noted that of the 122 C. sakazakii strains (representing multiple STs) that were evaluated by microarray analysis, as described in this study, only the ST64 C. sakazakii strains were found to possess the malonate operon. Additionally, we performed a BLAST analysis on several hundred C. sakazakii strains in our genomic collection (data not shown), and to date; only ST64 C. sakazakii strains have been found to be malonate positive both phenotypically and genotypically. It is evident from these analyses that the ST64 C. sakazakii strains: (a) form a tight phylogenetic cluster, and (b) share a genomic backbone closer to other C. sakazakii than that with other Cronobacter species while exhibiting genomic differences among themselves. RAST/SEED analysis of the malonate utilization operon of C. sakazakii ST64 strain 1121-73 showed that it was ~ 7.7 kbp in size and revealed a cluster of nine genes. A summary of these genes is shown in Additional file 4: Table S3. A physical map of the malonate utilization operon is shown in Fig. 4a. The operon is flanked upstream by gyrB which encodes a topoisomerase IV subunit B gene (EC 5.99.1), and downstream by katG, encoding a catalase/peroxidase gene (EC 1.11.1.6; EC1.11.1.7). When the operon sequences from selected strains representing this heterogenous group as shown in Fig. 3 were compared with C. sakazakii strain GK1025B, it was clear that the ST64 strains retained this conserved operon structure (Fig. 4b). Also, the malonate utilization gene cluster-flanking regions were found to be conserved among all Cronobacter species, even malonate-negative C. sakazakii strains like C. sakazakii strain BAA-894 (Fig. 4b bottom two tracks); however, the 7.7 kb malonate utilization gene cluster in these strains is instead replaced with a 323–325 bp nucleotide region, and is represented by the nucleotide region (bp position 1723016 to 1723340 in BAA-894 NCBI GenBank accession no: CP000783). This study identified for the first time a functional malonate utilization operon regulated by mdcR in C. sakazakii ST64 strains, which is highly similar to the operon described by Koo et al. for Acinetobacter calcoaceticus . However, it seems to be different than that possessed by the matR-regulated malonate matABC operon found in Rhizobium spp. in both size (7.7 kbp versus 7.0 kbp) and operon structure (9 genes versus 4 genes). MatR plays a dual role in the transcription of matR and matABC with malonate as a positive effector [47, 48]. Also, matA encodes malonyl-CoA decarboxylase, whereas matB encodes malonyl-CoA synthetase. The MatC protein appears to be an integral membrane protein that can function as a malonate transporter . Next, we analyzed the genomes of the ST64 C. sakazakii strains using whole genome sequences to understand the evolutionary relationship among malonate utilization operons found associated with other species of Cronobacter. The pan-genomic-based Cronobacter microarray described by Tall et al. contains 50 probe sets representing orthologous alleles from C. dublinensis subsp. dublinensis strain LMG23823T, C. muytjensii strain 51329T, C. malonaticus strain LMG23826T, C. universalis strain NCTC9529T, and C. turicensis strain LMG23827T. Additional file 5: Table S4 shows microarray analysis of ST64 C. sakazakii strains using these probe sets alone. The results predict a significant degree of sequence homology (as inferred from interpreting the presence/absence calls) among these orthologous alleles. The malonate utilization operon containing contigs were identified in all the genomes of the ST64 strains from Table 1 by querying them with the annotated operon from GK1025B. BLAST analysis, reference mapping with Geneious, and RAST table comparisons yielded a fully annotated operon in the 24 ST64 C. sakazakii strains, and six other Cronobacter species, excluding C. sakazakii strain BAA-894. Based on our observations (from Figs. 2, 3) about the genomic differences among the Cronobacter species and related data, we analyzed the sequence similarity of the nucleotide sequences encoding the operon in the six other Cronobacter species using the LASTZ algorithm as implemented in Geneious. This presents both the LASTZ pairwise alignment blocks on the top and multiple alignments annotating the alleles in the bottom panel. The LASTZ alignment (Fig. 5a) ignores coding sequence bias  to create optimal conserved blocks. The reference mapping tool highlights allelic differences in each strain when compared against the reference ST64 C. sakazakii strain GK1025 genome. The results point to a genomic region with conserved blocks of sequences (Fig. 5a) in spite of extensive nucleotide differences (Fig. 5b) seen in distant species. It is apparent from this analysis that the malonate utilization genomic region has undergone independent evolution among the various Cronobacter species with C. malonaticus and C. universalis appearing to be more similar to the ST64 C. sakazakii malonate operon than that of the other species. This level of genomic difference among the species is consistent with other reports from our group [16, 19, 35] and others . Using BLAST analysis and reference mapping, the gene content of the operon in all Cronobacter species appear to be preserved with conserved amino acid sequence (data not shown) across the species. As a use case to illustrate this, we compared the amino acid sequences of malonate decarboxylase (Mdc) from all the species using Clustal Omega. The resulting alignment, shown in Additional file 6: Figure S2, points to a highly conserved protein with only a few changes in the amino acid moieties. This is reflected in minimal number of changes in the amino acid composition between C. sakazakii strain GK1025B and C. condimenti strain 1330, the two phylogenetically distant organisms seen from this multiple alignment (Additional file 6: Figure S2). Taken together, these data suggest that the origins of the C. sakazakii ST64 malonate operon can be explained in a couple of hypotheses. One hypothesis may be that this operon was acquired after the predicted evolutionary event  when C. sakazakii, C. universalis, C. turicensis and C. malonaticus evolved from their primordial ancestor during the event that led to them jumping host species e.g., from their plant-associated host to a secondary host. Furthermore, an insect vector such as the common filth fly as suggested by Lehner et al. may have been involved . This possibility alludes to a post-speciation gain-of-function adaptation of the ST64 lineage of C. sakazakii. The 325-bases pair region following the gryB coding gene in (Figs. 4, 5) the genome of C. sakazakii strain BAA-894 is also seen in many Enterobactereaceae members lacking the malonate utilization phenotype (GG, personal communication) and offers support of this hypothesis. Under this hypothesis, the operon originating from a hitherto unidentified parent might have been inserted into the ST64 C. sakazakii lineage as it adapted to changing host preferences and making it a more recent event. Alternatively, the conservation of this operon across every Cronobacter species also points to an older genomic feature inherited from earlier ancestral stock and was retained initially in all Cronobacter species. During evolution with the exception of ST64 C. sakazakii group, all other lineages of C. sakazakii of the now non-plant host-adapted lineages might have lost this operon reflecting a cessation of a need-to-retain malonate utilization phenotype, a loss-of-function evolutionary event. Speculatively, this would render the ST64 clade to be one of the oldest C. sakazakii lineages, retaining specific plant-associated features of the primordial ancestor of the genus, but phylogenetically placed with other C. sakazakii lineages which have clearly adapted to more modern hosts and environmental niches. A comprehensive molecular evolutionary analysis of a few hundred genomes may shed light on this critical aspect of the evolutionary history of Cronobacter. By 72 h post injection, all 12 ST 64 strains were lethal to zebrafish embryos; nine of the strains presented at least a 50% mortality rate with two strains (GK1025 and Comp 59) possessing a 90% mortality rate (Fig. 6a, b). This data provide evidence that Csak O:2, ST64, malonate-positive C. sakazakii strains are as virulent as other Cronobacter species and non malonate-utilizing C. sakazakii strains, as reported by Eshwar et al. and Chase et al. .
Until this investigation, the presence of plant and food-associated, malonate-positive C. sakazakii strains was under appreciated, possibly leading to misidentification when relying on phenotypic analysis alone. A custom designed pan genome microarray was useful in characterizing the total genome content of 23 Csak O:2, ST64, malonate-positive strains; and showed for the first time that these C. sakazakii strains were highly related in total gene content, serotype, and ST. To date, DNA microarray and WGS analyses clearly demarcated only the ST64 group of C. sakazakii strains as being genotypically positive for the malonate utilization operon; and phenotypically, these strains were found to utilize malonate. Genus wide, the microarray correctly pointed to other genotypic malonate-positive Cronobacter species, namely C. malonaticus, C. turicensis, C. universalis, C. muytjensii, C. condimenti, and C. dublinensis possessing the alleles of this operon. As far as whether or not C. sakazakii strains of other STs possess the alleles we have not seen this in any other C. sakazakii strains. Other researchers have found C. sakazakii ST64 strains which were associated with plant-origin foods, but no mention of malonate utilization has been reported . BLAST analysis of more than 140 genomes (from this study; Ref. and many genomes with known ST represented in Additional file 3: Figure S1) clearly pointed only to the ST64 strains possessing this operon and non-ST64 strains were negative. As an emerging pathogen, the host range of Cronobacter in general, C. sakazakii in particular, is expanding and future surveillance studies should help answer this important hitherto unanswered question. This study further establishes parallel MA and WGS analyses as powerful platforms for genomics research of Cronobacter while generally underscoring the applicability of WGS data to answer both biological and evolutionary questions about the members of this emerging pathogenic genus. The data collected in this study increases the number of publicly available Cronobacter genomes, including malonate-positive C. sakazakii strains isolated from both powdered infant formula and dairy powder manufacturing environments, dried milk powders, spices, and clinical sources. This study clearly establishes the power of genomic data from Cronobacter strains that can be harnessed to develop rapid and inexpensive next generation molecular diagnostics. The data presented also supports the establishment of the Zebrafish embryo infection model and its ability to play a key role in high throughput comparative genomics experiments to help unveil the virulence determinants of Cronobacter spp. that contribute to human disease. BDT, AL, AE, GG, IRP, and JG participated in the design of the study. HRC, EP, TC, YY, HJ, CL, JP, SJ, SJ, JW, YL, MK, GG, and BDT performed the microarray, WGS, PCR, phenotypic assays, and collected data. HRC, AL. AE, JG, IRP, GG, HJ and BDT analyzed the data. All authors drafted the manuscript. All authors read and approved the final manuscript. We thank the student internship programs sponsored by the Offices of International Affairs of Kyungpook National University, Daegu*, and Gachon University, Gyeonggi#, Republic of Korea for supporting student interns: HyeJin Jeong*, ChaeYoon Lee#, Hyerim Choi*, Mijeong Kim#, Eunbi Park*, YeonJoo Yoo#, Jihyeon Park*, Seungeun Jeong*, Soyoung Jun#, Jungha Woo#, YouYoung Lee#, and TaeJung Chung#. We thank the University of Maryland, Joint Institute for Food Safety and Applied Nutrition (JIFSAN) for supporting JIFSAN interns Samantha Finkelstein and Flavia Negrete. We also thank the Oak Ridge Institute for Science and Education of Oak Ridge, Tennessee for sponsoring research fellows Hannah R. Chase and Hyein Jang. Nucleotide sequences from this study were deposited into GenBank under accession numbers identified in Table 1 and released to the public by submission to the NCBI under the Cronobacter GenomeTrakr Project: FDA-CFSAN bioproject: PRJNA258403. All authors have consented to publish the results described in this research article. Funds supporting this work were obtained internally through US FDA appropriations and this research was also funded in part by the University of Maryland JIFSAN Program through a cooperative agreement with the FDA, #FDU001418. 13099_2018_238_MOESM1_ESM.pdf Additional file 1: Table S1. Pearson’s correlation anlaysis of malonate-positive C. sakazakii strains compared to other Cronobacter and non Cronobacter strains. 13099_2018_238_MOESM2_ESM.pdf Additional file 2: Table S2. Gene difference analysis of malonate-positive C. sakazakii strains compared to other Cronobacter and non Cronobacter strains. 13099_2018_238_MOESM3_ESM.jpg Additional file 3: Figure S1. This phylogenetic tree was downloaded from the NCBI website (https://www.ncbi.nlm.nih.gov/genome/tree/1170) which is part of the NCBI C. sakazakii genome tree report resource provided by NCBI and then ST information for each strain in the tree was obtained from the Cronobacter MLST website (http://pubmlst.org/cronobacter/) was manually overlaid onto the tree. The tree/dendrogram in Entrez Genome (https://www.ncbi.nlm.nih.gov/genome/) was developed using pairwise GenBank assembly sequence comparisons as a result of megablast alignments. The pairwise distance is retrieved from the BLAST results by a gpipe script as Symmetric identity (which is converted to the distance between assemblies). Personal communication of NCBI’s phylogenetic analysis was provided by Boris Fedorov, Igor Tolstoy, Tatiana Tatusova, and Richa Agarwala, NIH/NLM/NCBI. 13099_2018_238_MOESM4_ESM.pdf Additional file 4: Table S3. Description of malonate utilization operon in ST64 Cronobacter strains described in this study. 13099_2018_238_MOESM5_ESM.pdf Additional file 5: Table S4. Additional table. 13099_2018_238_MOESM6_ESM.docx Additional file 6: Figure S2. Clustal analysis of mdcB protein from ST64 and non-C. sakazakii strains. Proteins sequences were retrieved from the annotations found in NCBI or RAST/SEED server originally carried out as part of this study. The sequences were subjected Clustal Omega multiple alignment. Amino acid substitutions in different species are noted in the illustration reflecting the nucleotide diversity discussed elsewhere. Joseph S, Sonbol H, Hariri S, Desai P, MacClelland M, Forsythe SJ. Diversity of the Cronobacter genus as revealed by multi locus sequence typing. J Clin Microbiol. 2012;50:3031–3039. http://jcm.asm.org/content/50/9/3031.long. Affymetrix. Expression analysis technical manual, with specific protocols for use with the hybridization, wash, and stain kit. 2014. http://www.affymetrix.com/support/downloads/manuals/expression_analysis_technical_manual.pdf.